Are there microtransactions in Apex Legends? Whether or not there are microtransactions and loot boxes available in Apex Legends. With Apex Legends being free-to-play, many have wondered whether or not there are microtransactions available in the game. As of right now, there are a variety of different microtransaction options in Apex Legends from a Season Pass to special Apex Packs that work in a similar fashion to traditional loot boxes found in games like Overwatch. While some of these items can be earned in-game, others require a manual purchase in exchange for digital currency. To help simplify everything, we’ve put together a full guide on all microtransactions in Apex Legends! There are a variety of different microtransaction options available in Apex Legends. While new Legend characters aren’t included in the Battle Pass, all of the cosmetics you unlock through the Battle Pass are yours to keep forever, even after the Season concludes. According to Respawn, each Season will last around three months. What’s nice is that as of right now, all of the microtransactions in Apex Legends appear to be cosmetic in nature with the exception of purchasable Legend characters like Caustic and Trapper. So, if you’re worried about pay-to-win, rest assured that there are no pay-to-win options in Apex Legends. To view the items you can purchase in Apex Legends and their price, you’ll need to tab over to the Apex Store. There, you can browse featured items in the Rotating Shop, Apex Packs, Legends, and stock up on Apex Coins. Of course, Apex Coins aren’t the only form of currency in Apex Legends. You can purchase Apex Coins in exchange for real money in Apex Legends. 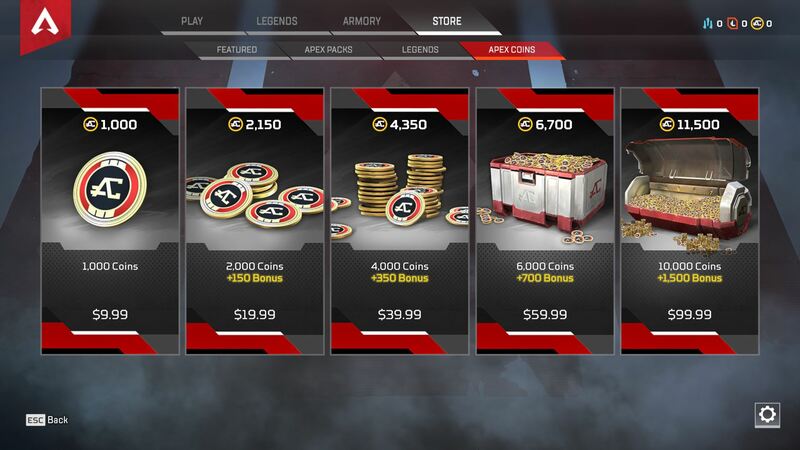 Apex Coins are the easiest form of digital currency to use in Apex Legends, as they can be exchanged for just about anything in the Shop, including new Legends. Apex Coins are acquired in exchange for real money at varying price tiers, which we’ve listed down below. In addition to Apex Coins, you can earn Legend Tokens by playing Apex Legends and increasing your Player Level. Like Apex Coins, Legend Tokens can be used to unlock new Legends and purchase items in the Rotating Shop. It’ll cost you 750 Apex Coins (approximately $7.50 USD) to unlock new Legends, or 12,000 Legend Tokens. There are also Crafting Metals available in Apex Legends. To earn Crafting Metals, you’ll need to open Apex Packs by either purchasing them, or earning them by playing the game and leveling up. Crafting Metals are primarily used to create and purchase cosmetics. For example, you can buy Legendary skins for 1,200 Crafting Metals. 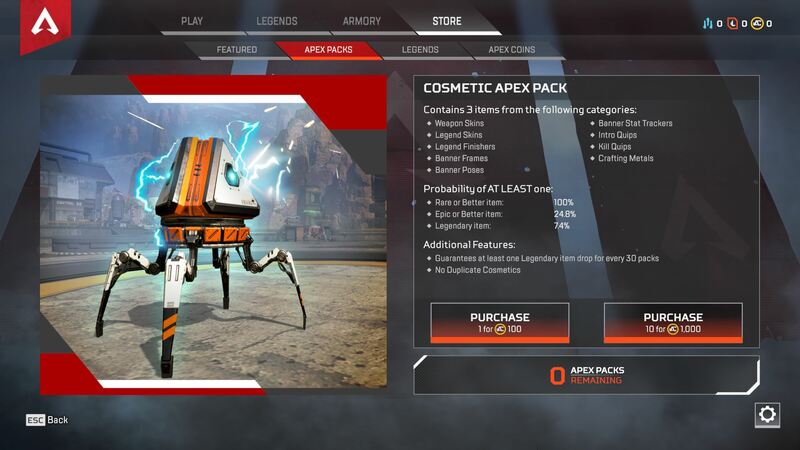 You can earn cosmetic items by opening Apex Packs in Apex Legends. Skins are one of the main cosmetics available in Apex Legends. They can be purchased directly using currency like Apex Coins, Legend Tokens, and Crafting Metals, or they can be unlocked by opening Apex Packs. Apex Packs work like loot boxes in games like Overwatch, and can be either purchased or earned by playing the game and leveling up. Apex Packs offer three random items with one guaranteed Rare item per Apex Pack, and a Legendary item every 30 Apex Packs. Additionally, you are guaranteed to never receive a duplicate item from an Apex Pack. Which is good news, especially if you intend to unlock all 40 skins for each character available in Apex Legends. Note that character skins have different rarity tiers including Regular, Rare, Epic, and Legendary. The higher the rarity, the slimmer the drop chance in Apex Packs and the more expensive to purchase using currency like Apex Coins. In the Rotating Shop, players also have the opportunity to purchase “Exclusive” Legendary Skins, likely for a limited period of time. 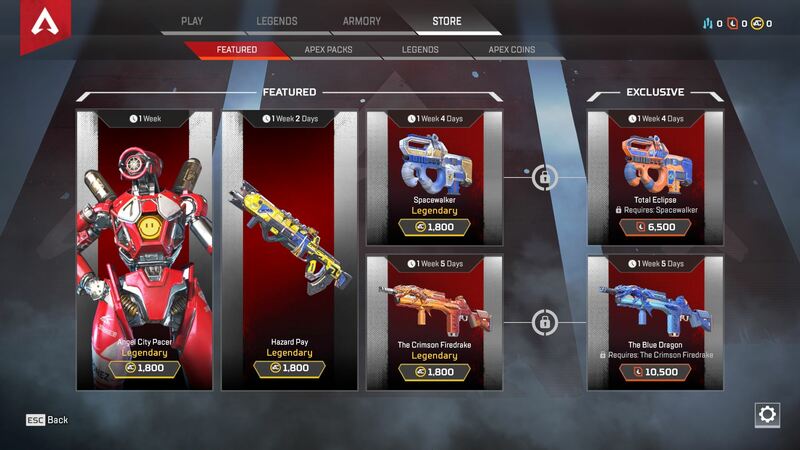 Other items available in Apex Legends include weapon skins with the same rarity tiers as skins including Regular, Rare, Epic, and Legendary. To further tweak your Legends, you can unlock character finishers for your melee kills, character quips that expand their dialogue options, and character banners. Character banners are customizable “player card” cosmetics which include badges, poses, stat trackers, and frames. After reviewing the microtransaction options available in Apex Legends, what are your thoughts? Are you considering purchasing Apex Coins, or would you rather earn Legend Tokens and Apex Packs by playing the game? Let us know down in the comments below! For more on Apex Legends, be sure to check out some of our previous guides including whether Apex Legends has cross-platform support, where to download Apex Legends, and a recap of the Apex Legends reveal livestream.